All major junctions and all sites (stopping places) are clearly signposted, but please note: this signposted is only fully functional for travel in a clockwise direction, as shown on all trail maps. Note also that in some cases only the Trail logo appears on signage – so please familiarise yourself with these. 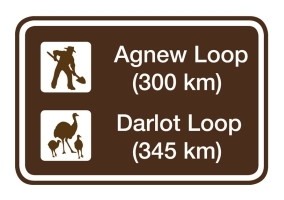 The Man with the Shovel marks the Agnew Loop, while the Emu and Chicks marks the Darlot Loop. You are strongly urged to carry up-to-date and detailed road and / or topographic mapping to augment the map in this brochure, which is pictorial and symbolic in nature. You will be travelling in remote locations and are responsible for knowing your surrounds – and your options - at all times!